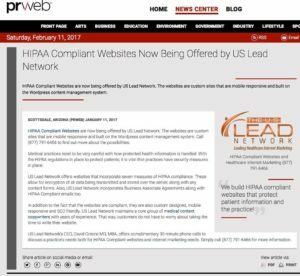 US Lead Network offers a medical press release writing service that not only supplies the healthcare content writing for the release, but also will publish it on PRWeb. For over five years, US Lead Network has been publishing first rate press releases on the PRWeb platform. Not only do the releases reach hundreds of media outlets quickly, but they also go through the Google News cycle and get indexed in all major search engines. And if that wasn’t enough, PRWeb has amazing authority in the eyes of Google, so any link to a medical practice website obtains immediate credibility. WHAT ARE THE REASONS FOR PUBLISHING A PRESS RELEASE? The conventional reason for publishing a press release is for an “occurrence” with the practice. This could be a new location, provider, service offering, etc. However, the new style of thinking is that a press release may be published for any number of reasons to put your practice’s name into the public’s eye. For example, you may be a plastic surgeon who has been offering a minimally invasive breast augmentation procedure for years. You like the procedure, outcomes and revenue are excellent, so you would like to increase that patient base. Therefore, you can easily have us publish a press release announcing the technique, even though you have been utilizing it for years! Specials are a great reason to publish a press release, a new website or video channel, open house, community seminar or research project. There are any number of traditional or modern reasons to publish a release, and it’s a great idea to put out at least one a month. The writers at US Lead Network are all US based with years of expertise in healthcare copywriting. Our work is guaranteed, so we will make any necessary edits until you are satisfied. Whether you need a two hundred word press release or a lengthier one, we are up for the task. Simply contact us today to get started!